Bio-inspired robotics is the practice of making robots that are inspired by real biological systems, whilebeing simpler and more effective. 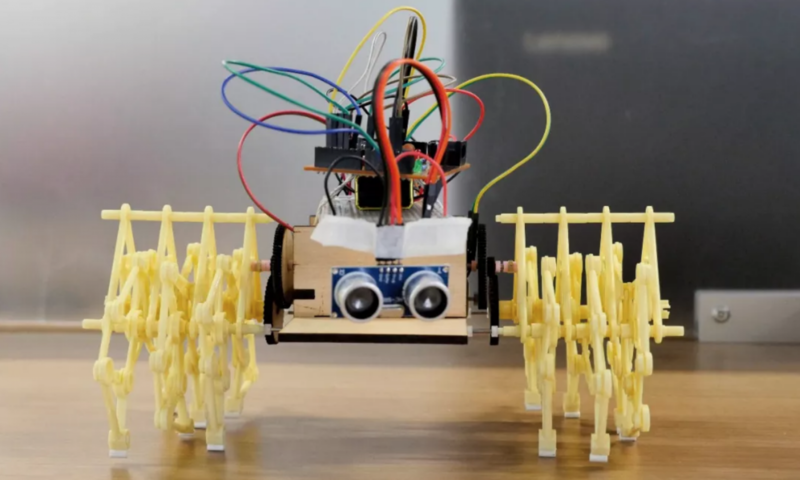 This kind of robots are made of soft materials like silicone rubber andlatex tubes and they replicate the structure of simple living organisms like plants, worms and squids.The class project will be to create a “flower robot” able to move its leaves when inflated withcompressed air. Each group of student will use different techniques like laser cutting, molding & castingand 3D printing to make a unique bio-robot. Mass production is at the base of economic growth, but in the long run it will not be sustainable anymore.We have to find new methods of designing and producing everyday products, to make their productionlocalized, personalized and sustainable. In this class we will experiment new ways of making clothes andfabrics. In the first Part of the course, we will use sustainable materials, like food waste and bacteria to dyethe fabric or bio-plastics made from potato starch, and we will set-up a cultivation of Kombucha bacteriasto make 100% sustainable green leather. Mass production is at the base of economic growth, but in the long run it will not be sustainable anymore.After experimenting with new methods of producing sustainable textiles. In the second part of the class, wewill explore how to design personalized garments using 3D scanners and laser cutters. Each group willdesign a Wearable Device for Sustainability (WDS), a customized piece of garment that integrate fabricscreated in the first module and electronic sensors that detect information about the environment, like airquality. It should be no secret that mushrooms are incredible organisms — they are edible, they canbio-remediate toxins, but did you know that they can also be used as an organic buildingmaterial? An exciting branch of research involves quick-growing mycelia, the reproductivesystem of mushrooms, which can be cultivated, dried and developed as a potential buildingmaterial that is stronger pound-for-pound than concrete! Moreover, the mycelia is 100% natural, and in fact can be eaten or mixed into tea at any point throughout its lifespan as abuilding block! This has fascinating implications on the future of green building or products!In this biological take on a molding and casting workshop, students will build 3-D formwork for mycelia cultures and grow their “cast” within that formwork. Our dependence on fossil fuels has certainly gone to some alarming extremes: pollution, environmentalcatastrophe, even war! Increasing public opinion and investment is favoring green energies, many ofwhich start with our Sun. Solar energy is carbon-free, everywhere, and abundant. Nature demonstratesthe potentials by utilizing solar energy through the process of photosynthesis. Indeed, that potential hasbeen developed into a number of synthetic techniques, i.e. solar cells, which emulate photosynthesis togenerate electricity, sometimes to greater efficiencies than fossil fuels. Compared to syntheticphotosynthesis, natural alternatives, or bioelectrochemical processes, offer intriguing advantages. Forexample, photosensitive components are assembled and maintained by living organisms that selfrepair, reproduce and store energy for power generation in times without sunlight. Have you tried touse a solar panel on a cloudy day? Further, plants are intrinsically tied to air recycling in theatmosphere. Can you imagine city parks acting as distributed power stations or charging yoursmartphone from the potted plants in your window? Lets face it, powering a light bulb or otherwisewith plants is incredible, if not just plain awesome! Programming is used for almost everything! Robots. Satellites. Medical sciences. Self-drivingcars. Video games! Movies. Websites. Apps… Considering our deep reliance on programmedthings and computing frontiers such as internet of things, artificial intelligences and augmentedreality, computer programming is an essential skill for absolutely everyone. Further, computerprogramming in itself is less about strictly learning coding syntax and more about problemsolving. As opposed to an end in itself, the thinking methodology of programming is a tool we canuse to do more powerful and interesting things in any other field. Often considered something relegated to the future, artificial intelligence ( AI ) algorithmsand techniques are already a part of our everyday lives’, i.e. smart devices, predictive searchalgorithms, video games, Siri. Familiarizing young students with the technical and conceptualfoundation of AI including algorithms, data structures and programming/ coding, is essential to,not only the development of AI, a knowledgeable interface with AI-backed tools and systems.